Here it is! "The Announcement"
As Jesus taught, "Seek and Ye Shall Find" and the "Truth Will Set You Free"
Order Direct from Paradis Publications Using Your PayPal Account--Shipping is Free! At this time in history, new dispensations of music are being provided from the Celestial Realms for multiple purposes, including as a form of communication between Twin Flames and Soul Mates. This book also introduces a new way of learning that incorporates music in engaging, creative, and transformative ways to enhance and accelerate learning, and to lift your spiritual vibrations toward the Heavenlies. Teachers, parents, students, college professors, researchers, scientists, writers, seekers, lovers and, of course, musicians will find this book of interest. Included in the book is introductory information for students and researchers who want to learn Kincheloe's advanced and rigorous qualitative research and writing process, the multidimensional critical complex bricolage. It is not your ordinary bricolage and it takes research and writing to a whole new level, yet everyone can learn it and learn how to create with the word. The process can be applied within all disciplines. Of interest to scientists and researchers is the introduction to Kincheloe's critical science of complexity and how he has synthesized enactive, chaos, complexity, and other theories. 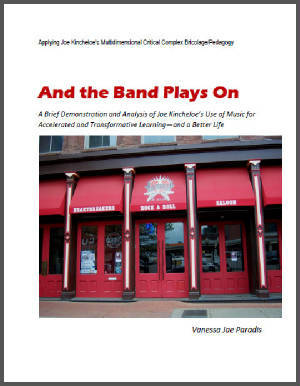 And finally, the author interprets two songs embedded in the writings of the late philosopher-educator, Joe Kincheloe, to demonstrate how he uses music in his work pedagogically. Following his lead by incorporating music into more facets of our lives in positive, transformative ways, we can create a better, more enjoyable life for ourselves and a better world for us all. You will never view music in the same light again. The author has researched the late Joe Kincheloe's work and has applied his critical complex theories for more than seven years. 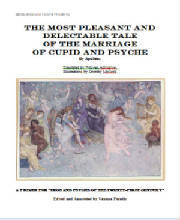 This book is a primer for the forthcoming series of books, Eros and Psyche of the Twenty-First Century. There will be several primers that orient readers to the original stories, including their historical, social, psychological, spiritual, and scientific significance that provide background information for the future versions for comparison purposes. This particular story is a translation of the earliest known written version of the story by Apuleius, produced in the late Second Century and translated by William Adlington in 1914. It includes numerous color impages. Since this is the Roman version, Eros is referred to as Cupid. The first part of the book is an introduction to Eros and Psyche, the presentation of a brief historical context, and the rationale behind the future stories. Next, the story is presented, fully illustrated, along with the author’s annotations which will help readers with interpreting the story and form a background context for the future stories to be published beginning February 14, 2016. You won’t want to miss the amazing stories of love, adventure, and mystery. Be ready! Believe In Magic! This is a collection of twin flame love poetry by Sōferia, also known as Psyche, along with transmissions from her twin flame, Emanu'el, also known as Eros, the God of Love, who resides in another dimension. Learn the true story of how he proved to her he can communicate through other people and how he guided her into finding a talisman in her back yard--and then had a diamond wedding ring delivered right to her door via her friendly neighborhood handyman. So many cultures and traditions teach that we all have one Divine Love to whom we are eternally connected that it makes one believe it may just be true. For Vanessa (aka Soferia and Psyche), it is true. In this book you will learn the difference between twin flames and soul mates and why the twin flame relationship is so important to not only your personal destiny, but the survival of Earth and humanity, and ultimately, the entire cosmos. Also learn why many people on the spiritual path have multiple names and their significance. 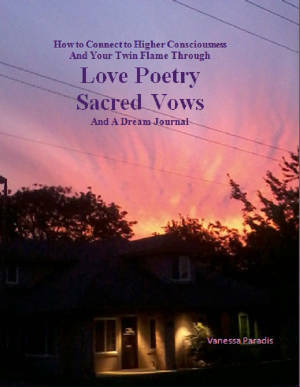 Reading the sacred poetry that has been channeled from the Higher Realms, viewing the dozens of colorful and inspiring photographs, and engaging in the dream and writing activities suggested in the book can help you reignite your divine sparks of passion and perhaps reconnect with your twin flame. As consciousness rises during this current evolutionary ascension process, people are being reunited with their twin flames and soul families.This book can help. Some couples have met during dreamtime and at higher levels of consciousness, planning their meeting in the physical. 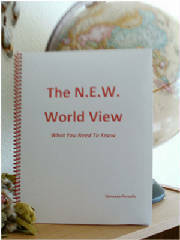 The Sacred Vows written between Soferia and Emanu'el, as channeled to Vanessa way back in 1989 are included in the book. She had saved them all of these years knowing they were important, but not knowing why until her twin flame recently told her what they really were and what they represented--an exchange of sacred vows promising each other that once they each finished their chosen work on Earth, they would reunite consciously. The book includes poetry, original photographs, and is interspersed with lined pages to record your dreams, interpretations, and notes. Be ready to write when you wake up each morning to record your dreams quickly before they slip away. You may just write your transmitted vows as had happened for the author. This book is also great for Support Groups, Dream Study Groups, and for Counselors to use with their clients as a way to help them open up about their experiences and relationships. Updated for 2015, this book provides new information about twin flames based on research and experiential evidence. It has more than 20 inspirational poems and color photographs. With a convenient spiral binding, the book is interspersed with lined pages so that it can be used as a Dream Journal to record you dreams and document your experiences. Writing and interpreting activities are suggested that can help you consciously connect to higher states of consciousness, and potentially to your twin flame and soul family. You will learn to interpret your dreams, signs, and other symbols that appear in your life. Engaging in the activities can increase synchronicities and serendipitous events as you become more aware of the "magic" and divine love in your daily life. Completed, it will become an important keepsake! 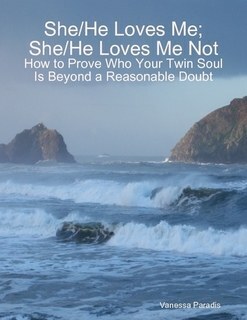 This book will help you discover if the person you love might be your Twin Flame. However, it provides even more--you can enhance any love relationship by identifying and appreciating the special gifts you have in common and those special gifts that are complementary. Based on extensive research into soul mates and twin flames/twin souls, the author presents what is understood about twin flame and divine love relationships from different cultural perspectives and provides guidance for you to identify the evidence for love in your own life. Find the special connections between you and the person you love today, and don't begin a new relationship without this Guide by your side. Includes lots of photos, links, and references to learn more. The world is just embarking on the most rapid global change that has ever been experienced. Some people call it the New Golden Age. Humanity is awakening, even though in many ways that does not appear to be the case. Much is going on behind the scenes--and there's so much knowledge and truth being released. But are we intellectually and emotionally prepared for it? Those who are not prepared will often feel caught off guard and overwhelmed. Take this highly engaging multimedia tour where you can learn much more about these changes and how a shift in paradigms can help us all not only cope, but thrive with them! Learn how education will be changing almost in direct opposition to what we call education today and how you can apply powerful new learning processes in your everyday life--including a significant increase in creativity. Links are provided where you can learn much more--TOTALLY FREE! Based on the philosophical work of the late Joe Kincheloe, the author presents the new paradigm the whole world is shifting toward and discusses why it's important to begin to understand it now. You will learn to navigate effectively through the predicted tumultuous times ahead and how to sift through the information jungle. A problem-solving process is introduced to help confront complicated issues that arise due to the increasing complexity of daily life. By understanding the philosophy and the principles presented, you will make quick and confident decisions, a necessary skill for these increasingly chaotic times. This article uses as a framework a quotation from Joe L. Kincheloe’s book, Knowledge and Critical Pedagogy: An Introduction to examine hermeneutics as interpretation in context with the rest of his legacy. There has been great contention over the use of hermeneutics and as all these debates tend to go, they are dualistic in nature and, as a consequence, travel in an endless cycle of debate. This article explores how Kincheloe provides a means to catalyze the conversation and get researchers out of the Ouroboros. In this article you'll be introduced to key codes and how to identify and link similar key codes in various texts to gain a greater understanding of the obscure, hidden meanings by which some authors choose to communicate. 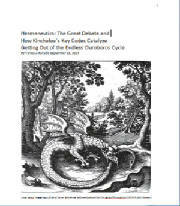 The article also provides an idiosyncratic application, among many possibilities, of Kincheloe's Fourth Dimension (highly intuitive) Research in order to understand the global shift of the ages, and an example of following his recommendation to “construct knowledge and formulate action based on eros with its drive to alleviate human suffering [that] serves as a counterpoise to the empire’s positivistic thanatos" (Kincheloe, 2008, p. 100). 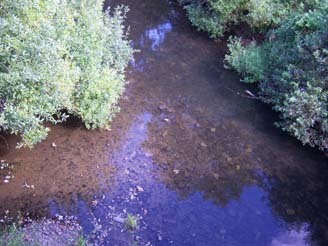 The article includes interesting photographs, links, and references for more information. 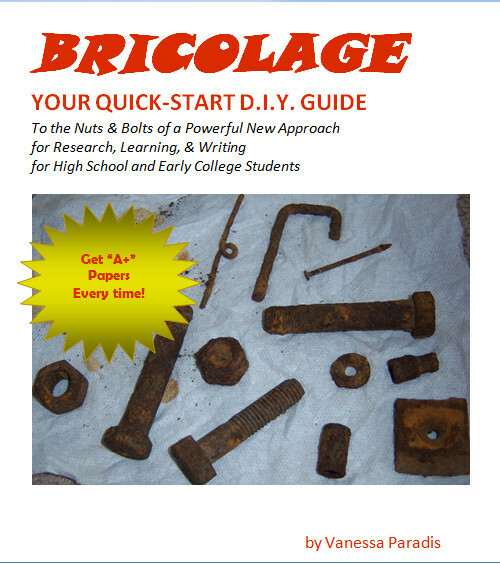 Learn the "nuts and bolts" of bricolage! Everyone can write! This book teaches a natural process for writing that capitalizes on interests, experiences, and abilities. We should all be writing our stories and from our personal perspectives and this book will help you do just that! It's a rich, multimedia,multidimensional presentation that begins to uncover the magic of words. You can start with the basics that are covered in this book with the introduction to Critical Complex Bricolage and then you can take your learning as far, wide, deep, and high as you want, by following the hyperlinks to free information about the process on the CD. Write the best researched papers ever! Includes samples of A+ papers.